Home GoRetro milestones Happy Birthday, Go Retro! Go Retro turns three today! 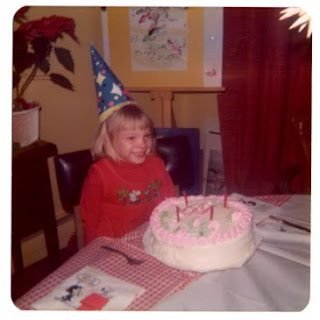 Yes, I realize the picture I found is actually from my fourth birthday – however, it was either use that or a photo from my first, and fourth is definitely closer to third. Anyways, it’s not important – the point is I began this blog three years today and have been quite happy with how I’ve been able to turn something I’m passionate about into a fun little hobby. The biggest difference that I can think of between the blog now and when I started it is that during the past year I seem to have found my blogging "voice." My early posts were very subjective and journalistic in nature - pretty snooze inducing stuff. In fact, it wasn't until a year ago that I realized that blogging is all about injecting a site with your personality and opinions - and when I started doing so, that's when I noticed my number of followers starting to creep up. I also want to thank everyone who enjoys and supports my blog and leaves comments. At the risk of sounding corny, it really does make me feel good to know I add a little bit of humor or happiness to someone's day. In somewhat related news, Ringo Starr turned 70 years old yesterday! My first thought upon hearing that was WTF?!? He managed to make this 38 year-old Beatles fan feel OLD. it's my bday today, too. my human one. happy bday go retro! Pam, It's been great reading your posts, Congrats on the 3 year mark! Looking forward to reading more of Go Retro! Happy Birthday! You don't look a day over two! Hope to see you for many more years!! Congrats on three years of Go Retro...your blog is exactly one year older than mine! I love your cute picture. Happy birthday. I always look forward to reading your posts. Happy Bloggy Birthday! Three years is a long time to be blogging! I bow to you! Thanks, everyone, and I love reading all of your blogs! Congrats baby!! A blog can change SO much from its inception. I've had many, but I think I've finally nailed it, as far as what I love to write about most. Your blog is great, and really takes me back. Keep up the great work! !